All the work has been fun though and I’m sure it will all pay off. Right now though, I’m just looking forward to parking my rear-end on a beach in the Caribbean! It is officially 8 days and counting today! I’m not sure if I’ll be able to squeeze together a review next week or not but if I don’t, I’ll see you all in August when I get back home and hopefully back to a normal schedule! haha. But without further adieu, let’s check out this Quick Draw I managed to dig out of my archives! In case you forgot what a Quick Draw is, take a read over the description from our first episode a little while back, link here. Now the Shark is a pretty popular cigar and I’m pretty sure a lot of you have heard about it before, or likely enjoyed one yourself. If not, here’s a bit of background. 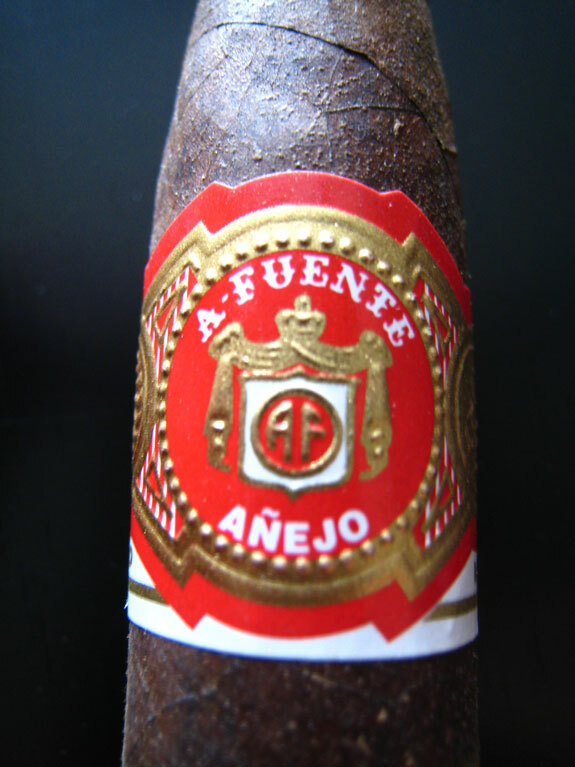 The Anejo line by Arturo Fuente is special limited release that occurs every year around only Christmas and Fathers Day. If you are seeking these, make sure to keep a keen eye out around that time because they seem to fly off the shelves. This particular vitola is called the No. 77 but has been dubbed the “The Shark” due to the box pressed torpedo top, which looks sorta like a shark fin. Pretty cool name if you ask me. I managed to score one of these in a trade around Christmas time and it’s actually from the 2010 crop so it had about a year of age when I took these notes down on it. Tony also reviewed one awhile back that you can find linked here. Right off the bat when you light this cigar up you know you are in for an interesting experience. You pick out some chocolate, coffee and nutty notes served with a slight side-dish of spices that all balance together amazingly. The body starts off in the low end of medium and the retrohale gives you a nice little bite with a smooth coffee or espresso flavored finish that just rounds up the whole experience nicely. As you burn through this cigar you get all kinds of interesting flavors that include cedar, baking spices, chocolate and espresso. They all seem to take turns being the dominant force and always balance out perfectly. In addition to the awesome flavors you can also expect an equally awesome burn on these sticks. This is a total cigar experience that you definitely need to have. The price on these is a bit high but I personally think they are definitely worth it and only get better with a bit of time in the humidor. I did have a chance to smoke a couple other vitolas but none of them seem to hold a candle to The Shark and I’m not the only one who seems to think so. I’m not a huge Arturo Fuente fan, I’ll smoke them every now and then but it’s not a brand I actively seek out. More so because a lot of their cigars seem to taste very similar apart from the Opus X line and the Anejo line. But here we have something that I will continue to seek out over the years and if they keep up the awesome flavors and great construction then you will not be disappointed if you do the same! The brew here was the Samuel Smith Winter Welcome Ale. It is a winter seasonal produced by Samuel Smith’s Old Brewery based out of England. You can expect to be ‘welcomed’ by an interesting orangey-amber ale that is super bubbly and flowing with sweet and floral flavors and a touch of spices common in winter seasonals. A tasty pairing indeed if you manage to find it around Christmas time. Great review Dan, I have one of these resting in my Humi I should pull it out and fire it up. I hope you have a great Wedding day good luck and enjoy buddy. Thanks Czerbe! Looking forward to it! Let us know your thoughts when you light it up! Nice quick review Dan. I’m a huge fan of these. I’ve got a handfull of these resting from different crops. It’s been a while since i lit one up, and you’ve inspired me to do so tonight. So did you end up lighting up the Shark? I’d love to hear how it went for you. Yea ended up lighting up a 2010. They really do improve alot with age. 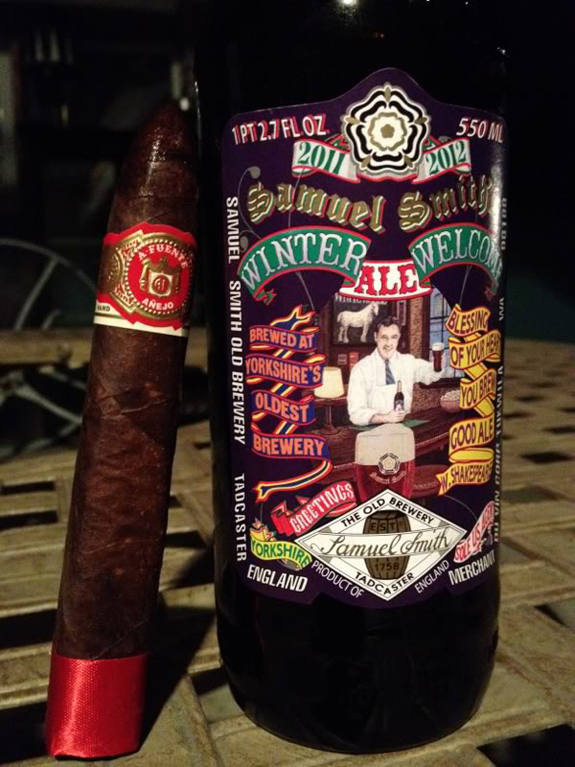 Some more subtleties that I didn’t pick up on last year when i smoked one from the 2010. I have a fresh one from this year I’ll be smoking in the next couple weeks. I’m interested in comparing them a little closer together. I haven’t had the pleasure of trying one of these yet, and in fact, haven’t a Fuente in any form for quite a while. If you can’t get to your review next week, I’ll look forward to your return. All the best to you and your soon to be bride. And thanks for the well wishes, much appreciated!